“I Know Myself” is one of the many outcomes of the long artistic process in which the artist obsessively 3D scanned herself in every affordable or possible ways, transforming herself into many different avatars. In “I Know Myself”, the artist’s 3D scanned body is trapped in a limbo between physical and virtual space. She repeatedly hit the walls, in a failed attempt to escape. 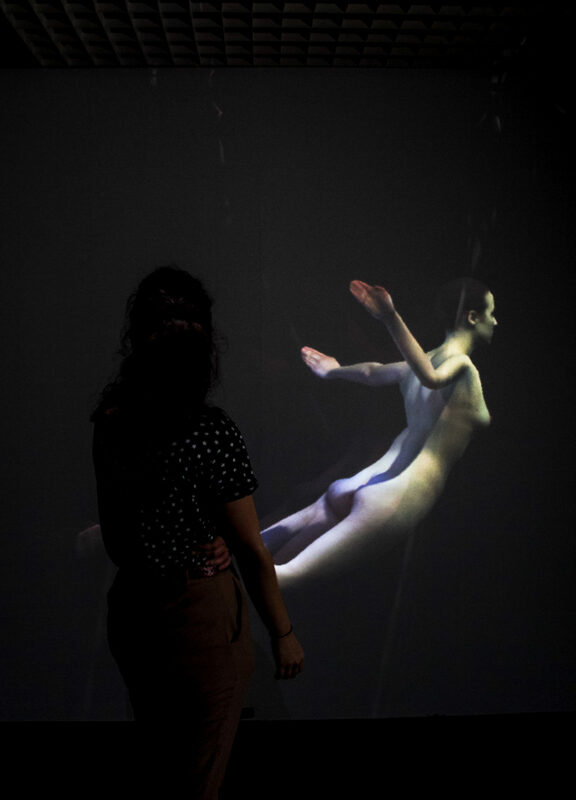 The force that drags her left and right, up and down increases based on the proximity and movement of the visitors, that cause violence and abuse of the virtual body by approaching or moving in front of the installation. Martina Menegon (1988, Italy) is a new media artist, programmer and educator. She creates interactive multimedia installations as well as virtual realities that deal with the alienation from physicality and question the gap between real and virtual, flesh and data. She regularly collaborates with Klaus Obermaier and Stefano D’Alessio, creating interactive performances and installations as well as teaching multimedia tools for interactive arts. She is teaching Interactive Art at the Art University of Linz and Public Space and New Media at the University of Applied Art in Vienna. Martina Menegon currently lives and works in Vienna.